Mild, rich cleansing lather. Fresh bouquet fragrance . This universal hand cleaner is extremely effective as a toilet soap whilst mild enough for general use. Pink Pearl possess extra emulsifying powers for grease and grime removal and is safe to use a body shampoo. For grease and light oil removal - apply Pink Pearl and rub well in, then rinse and dry. 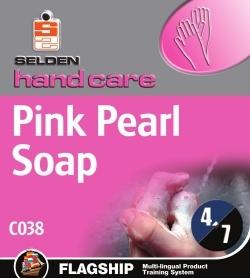 For normal washing - wet hands, apply a small amount of Pink Pearl and wash hands.